It all started in Kenosha, a town scrappy and small, with a skyline once dominated by American Motors. It may have been the fresh breeze off of Lake Michigan, but more than a few artists, musicians, actors and writers emerged from that town. Most of them had a solid working class point of view and an itch to do something with it. John Sieger is one of them. His first bands were influenced by the British Invasion and, later, the American music that inspired them, especially soul. No Hamburg in sight, but just across the border lay Chicago, where the nights playing bars went at least as late. John’s first band, The Starboys, tried to sell their originals to small crowds, then attempted the cover-band route briefly. After a glimpse that dismal scene, they headed home, tossing their velour and polyester outfits out the van window somewhere near the Wisconsin border. No more lounge gigs for them, they dove into their own stuff with a vengeance. Kenosha was just big enough to support a band, but too small to find five more kindred spirits, so when creative tensions ended that chapter, John gravitated to Milwaukee, a town that nurtured to many great bands over the years. John's next band, R&B Cadets, featuring Paul Cebar and golden-voiced Robin Pluer, was next. With packed dance floors all over the Midwest and few tours east, they soon had a following and a record deal. Their first, and last record, Top Happy, was released by Twin Tone in 1986. It featured four of John's songs and a track produced by the Jesus of Cool, Nick Lowe. With a healthy scene and plenty of fun gigs, inspiration was all around and soon, not only was his band doing songs he wrote, but other artists as well. Semi-Twang, John's next band, started as a side project, a way to deal with his song surplus, it veered ever so sightly towards country. Using the core of the Cadets and adding producer guitarist Mike Hoffmann and at different times, guitarists Mike Judy and Jason Klagstad, a virtual wall of twang gave the band their name. Demos got passed around and a buzz was heard from the coasts... soon the majors came calling. After signing with Warner Brothers the long process of making a record started. It was a lesson in the music business, the kind you may have read about — three producers, a large budget and, a record that was loved by critics and cited as an early alt-country entry. But it sold poorly. Soon Semi-Twang was back in town sans record company and licking their wounds. The inevitable wind-down began and the band called it a day a little while after. In 1993, John and his new family, wife Linsey and their three-year-old son Sam, then decided to give Nashville a whirl. During that time, John's songs had caught the ear of producers and artists like The BoDeans, Jerry Harrison and Dwight Yoakam. Harrison had a hit in Australia with Rev It Up. In Nashville, John was soon running with a diverse set of insurgent country artists, writing songs with Robbie Fulks, Joan Besen, Greg Trooper, Gwil Owen, Joy Lynn White and Phil Lee, the Little Jimmy Dickens from alternate universe. Feeling the tug of family ties, the Siegers returned to Milwaukee in 1999. That also saw the release of El Supremo, a record he recorded mostly in Nashville, with a stellar crew. In 2003, John released Her Country, co-written with Michael Feldman, host of public radio’s Whad’ya Know. They had met back in K-Town and started writing together, when Mike taught high school English and generated hundreds of wry, concise lyrics. That recording featured Springfield MO’s finest, The Skeletons, a band renowned for it's chops and humor. After a couple years leading The Subcontinentals and releasing the upbeat, The Early Years, the past popped up in a surprising way. Semi-Twang was asked to play the 20th anniversary of Shank Hall, a storied venue they gigged at on it's first night. The reunion, in late 2009, felt too good to end so they headed back into the studio. In 2011 critics and fans finally had a new recording to rave about, Wages Of Sin. The reconstituted band was good or better and asking themselves why it took so long to get back at it. Again in 2013, just to prove it wasn't a fluke, they dropped The Why & The What For. This third official collection also made it onto quite a few best-of lists. Semi-Twang is once again a going concern and a force to be reckoned with and starting on the next project. In 2012, John ran into Greg Koch, a Fender clinician and Guitar Player regular, outside of a coffee shop in the village of Wauwatosa, and Greg suggest they try writing together. Within six months, they had 67 tunes and Greg had an all-star record, Plays Well With Others, featuring other phenoms like Joe Bonamassa, Little Feat’s Paul Barerre, Robben Ford, Roscoe Beck and New Orleans ace, John Cleary. In the fall of 2013, they toured Italy, Austria, Germany and Denmark, where Greg has an avid fan base. 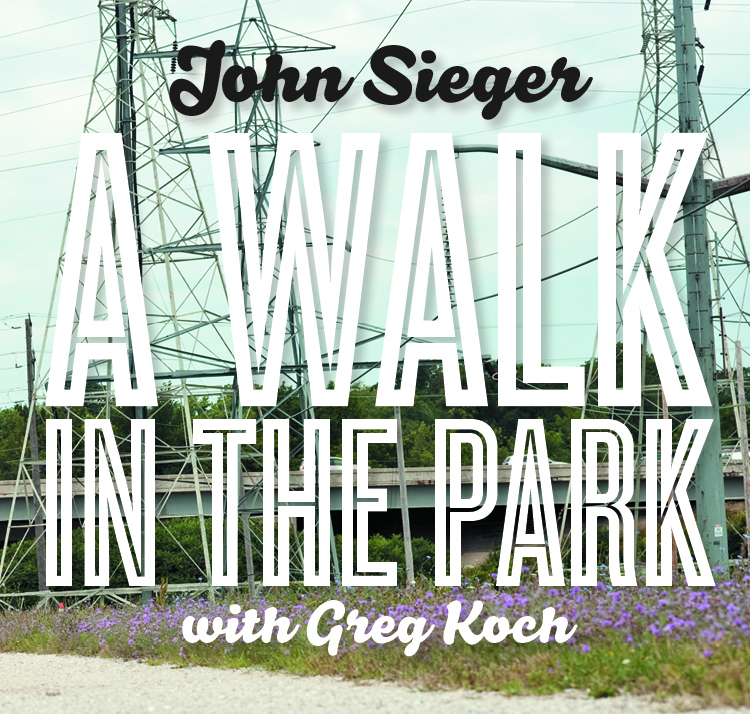 Now John has pulled another dozen songs from that same batch and released A Walk In The Park. This time they take a slightly more laid back approach, with members of Semi-Twang adding stout backup and Greg, once again, making all other guitar players want to lay down their instruments. All along, John has been teaching guitar and producing a successful series of song workshops at music stores and schools around Milwaukee, where his unique, insider take on the craft are sought after. He also has a regular column in Urban Milwaukee, Sieger On Songs, which looks at individual songs in depth. John continues to plow forward with projects planned for his recently upgraded studio, Room w/a VU and performance dates with Semi-Twang as well as Greg Koch.